Ron Hicks shows you how to get the most out of a portrait sketch and more in Mastering Oil Portrait Painting. Imagine breaking down even the most complex painting into just a handful of shapes. Painter Ron Hicks has found that the process of portrait painting can be intimidating, if not overwhelming, to even the most practiced painters because a lot of detail is often confused with what makes a successful portrait. For Hicks, it is just the opposite. Hicks believes that a powerful oil portrait–or painting of any subject, for that matter–is not in the details, but in the fundamental forms of a composition. A well-executed portrait is one that describes a person’s face or bearing with just a few shapes. Just as you can probably identify a friend or loved one from a distance because you know the general structure of their face and head, you can paint a portrait by representing those same large masses. Following this method, Hicks starts every portrait by first identifying the essential masses and how light filters over them. Understanding the light is key because within each of the masses is a light shape and shadow shape that will turn the form and create a sense of three-dimensionality in your painting. To accurately identify those masses and shapes, portrait artists often start by drawing several thumbnail sketches. Doing this allows the artist to explore different set-ups and discover what works best with the shapes in the composition. In the video clip above from Mastering Oil Portrait Painting with Ron Hicks, Hicks shows how he creates a series of rough drawings in order to settle on the right position and pose so that the composition is dynamic and the essential shapes of the model’s face are clearly identified. If you want to see more on how to harness the ability to paint a likeness–a must for any artist–Mastering Oil Portrait Painting with Ron Hicks is sure to lead you through the process in a comprehensive way. With years of experience as an instructor, Hicks is able to break down the art of portraiture into a series of understandable methods that are used repeatedly throughout the painting process. Most important, Hicks explains how a portrait, when done successfully, can go beyond a likeness to tell a story about the sitter or create an emotional pull that moves a viewer. Join top portrait painter Ron Hicks for a full hour of step-by-step oil portraiture techniques and an in-depth demonstration. Follow along as he shows how to create an accurate oil portrait painting while keeping true to your artistic voice and vision. Learn the essentials of portraiture, from sketching to depicting the subtle features of your model. Skip the guesswork and see results in your own work with up-close shots and step-by-step guidance. Master the fine art of balance with insight on editing features, creating a variety in highlights, and more. Make every brushstroke matter, with Ron’s approach to keep from overworking your oil portrait painting. Create at your own pace: start and stop the lesson when it’s convenient for you. Master the art of drama in oil portraiture with this brand-new Artist Daily Workshop DVD. 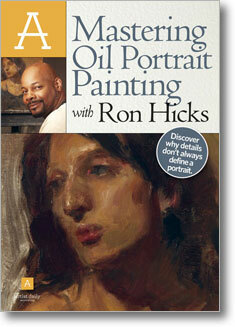 Order your copy of Mastering Oil Portrait Painting with Ron Hicks today! Join Ron Hicks one on one for an enlightening oil portraiture lesson. Go from model to memoir and transport viewers into a oil portrait painting narrative of what you see. Follow along with easy-to-see up-close views of each stroke. Expand your skills and enhance your work with portrait expertise. This is terrific – I could listen to Ron talk about his paintings all day long.